Ronnie James Dio (born Ronald James Padavona; July 10, 1942 – May 16, 2010) was an American heavy metal vocalist and songwriter. He fronted and/or founded numerous groups including Elf, Rainbow, Black Sabbath, Dio and Heaven & Hell. In the mid 1970’s, Deep Purple guitarist Ritchie Blackmore was planning on leaving, due to creative differences over the band’s new direction. Blackmore invited Elf singer, Dio along with Gary Driscoll to record two songs in Tampa, Florida on December 12, 1974. According to Ritchie Blackmore upon hearing him sing, “I felt shivers down my spine.”Being satisfied with the results, Blackmore decided to recruit more of Elf’s musicians and form his own band, initially known as Ritchie Blackmore’s Rainbow. They released the self-titled debut album Ritchie Blackmore’s Rainbow in early 1975. After that, Dio recorded two more studio albums Rising (1976) and Long Live Rock ‘n’ Roll (1978) and two live albums, “Live in Germany 1976″ and On Stage 1977 with Blackmore. Dio is credited on those albums for all lyrical authorship as well as collaboration with Blackmore on musical arrangement. In 1979 Dio and Blackmore split, with Blackmore taking the band in a more commercial direction, with Graham Bonnet on vocals and the album “Down to Earth”. Dio met guitarist Tony Iommi, and soon joined Black Sabbath, replacing the fired Ozzy Osbourne. The first album the band recorded with Dio as vocalist in 1980 was the acclaimed heavy metal masterpiece Heaven and Hell. Produced by Martin Birch, the album was a commercial success, particularly in the United States, where it reached number 28 on the Billboard 200 chart. The follow-up album, Mob Rules, featured new drummer Vinny Appice. In 1982, conflict arose over the mixing of the Live Evil album. Iommi asserted that the album’s engineer began complaining to him that he would work all day long on a mix, only to have Dio return to the studio at night to “do his own mix” in which his vocals were more prominent. This was denied by Dio. The conflict led to Dio and Appice ultimately quitting the band later that year. Wanting to continue together as a band, Ronnie James Dio and Vinny Appice formed Dio, the band, in 1982. Vivian Campbell played guitar and Jimmy Bain was on bass; the latter of whom Dio had known since the old Rainbow days. Their debut album, Holy Diver, included the hit singles “Rainbow in the Dark” and “Holy Diver”, the album’s title track. In 1984, the band released their second studio album The Last in Line, it was followed by their third album Sacred Heart, released in 1985 and their fourth album Dream Evil released in 1987. 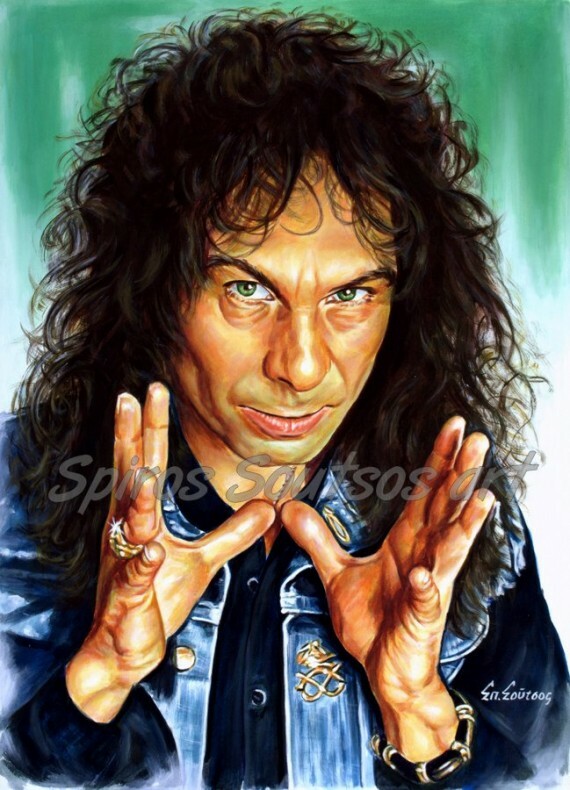 Ronnie James Dio is credited with popularizing the “metal horns” hand gesture in metal culture and is known for his medieval themed lyrics. Dio possessed a powerful versatile vocal range capable of singing both hard rock and lighter ballads. Dio sold over 47 million albums throughout his career.